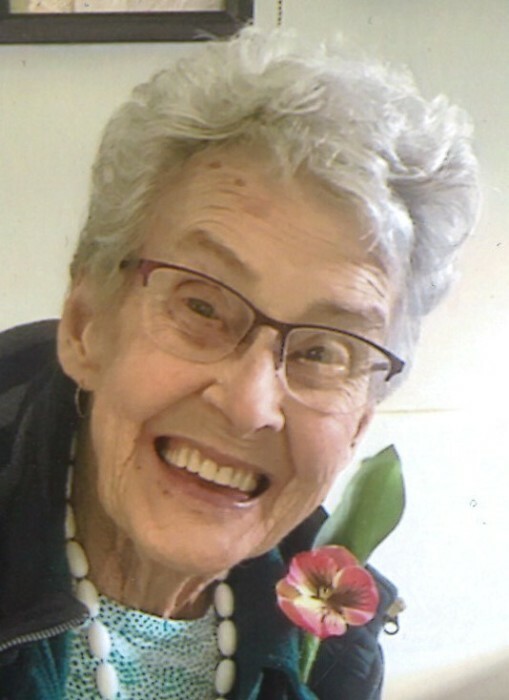 Obituary for Edna Mae Wickstrom | Grays Funeral Chapel LTD.
Edna Wickstrom, also known as Mom, Grandma Pepper, Grandma Brutus, GB, Granny Bear and Eddie, was born May 21, 1929 and went to be with her savior, Jesus Christ, on April 11, 2019 at the Carrot River Nursing Home. Edna was raised at the home place at the bottom of Bonnie Hill along with her siblings. She attended the Bonnie Hill school and then went to Rivier Academy in Prince Albert. Edna married Edwin Wickstrom and raised three children; Linda, Bill and Bev. Edna and Edwin started out farming north of Kinistino, and later sold the farm and moved to Nipawin. They then moved to Salmon Arm, BC and then back to Nipawin, where she volunteered many hours at the Salvation Army thrift store. After Edwin’s passing in 2002, Edna moved to Weldon the following year and in 2017, she moved to Carrot River Care Home. Edna enjoyed the outdoors, loved being in the barn and garden. She loved plants, crocheting, and spending time playing cards, baking and cooking with her family. In her life journey she made many friends. In 1975, Edna accepted the Lord Jesus Christ as her Savior. Edna was predeceased by Archie and Isabella Knox; her loving husband Edwin; daughter Linda Tarry; daughter-in-law Elizabeth Burns; grandchildren Dallas, Kirby and Sally; siblings Grace, Nora, Barb, Bill (Fuzzy), Florence, Eva and Ivy. Left to mourn her passing are Howard Tarry, Michael (Michelle) Tarry, Rhonda (Reg) Nickel, Mark Tarry, Annmarie (Greg) Tarry, Peter (Darla) Tarry; Bill Folster, Willy Folster, Danny Folster; Bev (Laurie) Meyers, Loriann (Murray) Stevenson, Dan (Stacey) Meyers, Curtis (Marcie) Meyers, Tanis (Clint) Blanchard, Cody (Jamie) Meyers, Ron (Laegan) Meyers; 37 great grandchildren, 5 great great grandchildren, 3 brothers-in-law Albert Braaten, Lemar Soyland, Russel (Budd) Snow; and numerous nieces and nephews. Mom (Grandma) will be greatly missed and will be forever carried in our hearts. The Celebration of Life and Memorial Service will be held at 11:00 a.m. on Monday, April 15, 2019 at Gray’s Funeral Chapel, 575 28th Street West, Prince Albert, SK with Mr. Murray Meyers officiating. A private family interment will be held at a later date. Condolences may be sent to the family at www.grays.ca. Funeral arrangements have been entrusted to Gray's Funeral Chapel.